At a grand gathering commemorating the 40th anniversary of China's reform and opening-up on Tuesday at the Great Hall of the People in Beijing, 100 Chinese nationals were awarded Reform Pioneer medals, and 10 foreigners received China Reform Friendship medals, marking China's acknowledgement of high achievers and the sacrifices they made to help realize the country's remarkable progress. Chinese President Xi Jinping and other national leaders were in attendance for the event which kicked off at 10 am. Premier Li Keqiang presided over the ceremony. 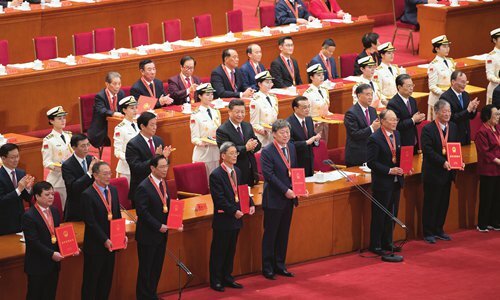 Wang Huning, a member of the Standing Committee of the Political Bureau of the Communist Party of China (CPC) Central Committee, announced the recipients of the awards that were bestowed by the CPC Central Committee and the State Council. They were awarded to distinguished individuals who have made outstanding contributions to the country's reform and opening-up. The 100 Chinese who received the medals come from various backgrounds, including scientists, military personnel, economists, grass-roots Party officials, model workers, athletes, writers and artists, State-owned enterprise managers, and private entrepreneurs. Chinese leaders presented the medals to the recipients. The recipients included outstanding individuals who made significant contributions to China's progress, including Yuan Longping, a Chinese agronomist and educator, well-known for developing the first hybrid rice varieties during the 1970s. His breakthrough has led hybrid rice to be grown in Africa, South America and Asia, providing a reliable food supply for high-risk famine regions. Pharmaceutical chemist Tu Youyou, co-winner of the 2015 Nobel Prize in Physiology or Medicine, extracted artemisinin from a plant that had been used in Chinese medicine and discovered it could be used to treat malaria. It was a significant 20th century breakthrough that has saved millions of lives in South Asia, Africa, and South America. "These honorees not only contributed to China's reform and opening-up but also helped other countries to solve problems. By awarding them, the CPC is announcing to all Chinese people and the world that China's continued reform and opening-up not only benefits China but is also a great historical event for all of humanity," Su Wei, a professor at the Party School of the CPC Chongqing Committee, told the Global Times. Some medals were given posthumously. Aircraft designer Luo Yang was the head of production and design for the Shenyang J-15 fighter jet. Luo died on November 25, 2012 from a heart attack at 51. At the time, Luo was under intense pressure to complete the design of the J-15 so it could land on an aircraft carrier. A military expert at a Beijing-based military academy who spoke on condition of anonymity told the Global Times, "Thousands of people like Luo have already sacrificed their lives for the country or are overloaded with work. China is still chasing other countries that have more advanced technology in the military or civil sectors, and it is impossible for China to realize its goals without hard work and sacrifice. There is no shortcut or chance for cheating, so the rising power must endure greater sacrifices, and sometimes existing powers try to contain us." "Luo was just one of the people fighting the tough fight to reach the goals that China has set in the sci-tech area. The Party needs to encourage them since China is still a follower in many fields, especially in the military industries. On the other hand, the government should pay more attention to the health of people like Luo, because they are the treasure of our country," the expert noted. Sonam Dajie, a Tibetan and deputy secretary for a county Party committee in Qinghai Province, received the medal as a representative of grass-roots Party officials. Dajie worked in Hoh Xil, a remote region located at a nature reserve in the northwestern part of the Qinghai-Tibet Plateau in Qinghai Province. He earned his reputation for his animal preservation efforts for protecting Tibetan antelope. In 1994, at the age of 40, he was shot and killed by poachers. Dajie died protecting the environment, and by awarding grass-roots Party officials like him, the Party hopes to send a signal that China's reform and opening-up take environmental protection efforts seriously, which China will always uphold during its future reform, Su noted. Another grass-roots Party official recognized for outstanding contributions is Bao Xinmin, from Huzhou, Zhejiang Province. A Party secretary for the CPC Committee of Yu village in Anji county, Bao committed himself to the concept that "lucid waters and lush mountains are invaluable assets." The idea, first raised by Chinese President Xi Jinping, guided Bao to lead local villagers to shut down cement factories and mines that were causing pollution and replace them with green tertiary industry. The move paved the way for the return of lucid waters and lush mountains and provided locals with huge economic payback. The people are "the creators of the great wonder of reform and opening-up" and "the source of power" to drive the campaign that started 40 years ago, Wang Huning said on Tuesday's conference, Xinhua reported. The distinguished medal recipients included figures from private sectors. Ma Yun, co-founder and executive chairman of the Alibaba Group and Ma Huateng, founder, chairman and chief executive officer of Tencent were awarded. "These people helped China to develop top IT companies in the world, and they are the source of China's confidence when it comes to competing with the West in the IT sector. The success of these people and their companies prove that China's reform and opening-up brought great opportunities and development to the private sector," said Bai Ming, a research fellow at the Chinese Academy of International Trade and Economic Cooperation. The candidates were selected based on local recommendations and after multiple rounds of review. The list of names along with their biographies was published by People's Daily on November 26. The 10 foreigners presented with China Reform Friendship medals included Singapore's late founding prime minister Lee Kuan Yew, Konosuke Matsushita, founder of Panasonic, Maurice R. Greenberg, former chairman of American International Group (AIG), who was a champion of economic cooperation between China and foreign countries, and Juan Antonio Samaranch, former International Olympic Committee president. "The CPC hopes to tell the world that China will never forget the assistance and support it has received from other nations, international organizations, and foreigners during its reform and opening-up. China could not have achieved such remarkable goals without their help, and China wants the world to understand this," said Su.